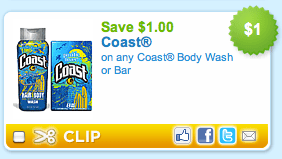 Head over to coupons.com and print this $1.00 coupon for Coast. The coupon doesn’t set a size restriction, so you can use it the purchase of a single bar of Coast. You could end up with a FREE bar of soap after using the coupon. This would make a great charity item.